Estimates of the size of the global soil organic carbon (SOC) pool have ranged between 700 Pg (Bolin, 1970) and 2946 Pg (Bohn, 1976), with a value of around 1500 Gt now generally accepted as the most appropriate (Table 1). This value is considered to be between one-half (e.g., Townsend et al, 1995) and two-thirds (e.g., Trumbore et al, 1996) of the total terrestrial carbon pool. The SOC pool plays an important role in modulating anthropogenic changes to the global carbon cycle. On the one hand, human activities such as land clearing, agriculture, and biomass burning lead to large emissions of C02 from the SOC pool, which tend to continue long after the initial perturbation to standing biomass has ceased. Conversely, the terrestrial biosphere is thought to be sequestering —■ 1 -2 Pg/year of anthropogenic CO, (the "missing sink") as a result of enhanced photosynthctic carbon fixation (e.g., Dixon et al., 1994). While standing biomass is thought to be responsible for the enhanced uptake required to balance the global anthropogenic CO, budget, the SOC pool is thought to provide the longer term transient sink for much of this carbon (Smith and Shuggart, 1993). This is due to the comparatively long time required for the SOC pool to establish a new equilibrium with the enhanced rates of delivery of carbon to the soil from standing biomass. Despite the major role of the SOC pool in the global carbon cycle, the dynamics of carbon exchange both within the SOC pool and between the SOC pool and the other major global carbon reservoirs are poorly constrained (Townsend et al, 1995; Tans et al, 1990; Trumbore, 1993; Fung et al, 1997). Major uncertainties still surround the size of the SOC pool, the capacity of the SOC pool to store additional carbon sequestered by living biomass, and the response of the SOC pool to changes in climate. Reducing these uncertainties will require more robust estimates of the size of the soil carbon pool and rates and fluxes through the soil carbon pool, as well as the development of additional constraints given by S13C and AI4C measurements (Fung et al, 1997). Implicit in the above statement is the need to be able to better predict variations in the SOC pool spatially in terms of soil substrate type, geomorphology, and climate, and assess the accuracy of such predictions against a consistent global observational database. The binding provisions of the Kyoto Protocol and the future possibility of carbon trading between countries introduce further urgency into efforts to establish verifiable inventories of carbon stocks and fluxes of carbon into and out of the SOC pool—the largest but least understood terrestrial carbon reservoir (IGBP Terrestrial Carbon Working Group, 1998). observational and modeling studies might be better integrated to improve the major uncertainties still surrounding the dynamics of the SOC pool. Jenny (1941) first elucidated the factors likely to affect the SOC content of soil, although the broad relationships between soil, vegetation, and climate had been identified previously. Also utilizing data from later studies, Table 2 lists the major factors controlling SOC inventories. FIGURE 1 SOC distribution in kg/nr1 among Holdridge life-zones (Post et ai, 1982). tor affecting the rate of production and the mineralogy of the soil substrate (e.g., Goh et al., 1976). It should also be noted that time plays an important role in determining the nature of the soil substrate, as soil-forming processes operate on time scales from years in the case of pedogenesis on recent alluvial sediments to millions of years in the case of the deep weathering of continental cratons. At the local scale (i.e., for a given climate) several other factors modulate the distribution of SOC across the landscape. Of primary importance at this scale is soil texture (Parton et al., 1987), a variable that is closely linked to other parameters such as bedrock type, nutrient status (cation exchange capacity), water holding capacity, illuviation and bioturbation rates, root penetration resistance, and the availability of oxygen to support aerobic microbial respiration. It is convenient that these variables tend to be coupled in such a way that soil texture becomes a useful proxy for all of them, with SOC levels generally increasing with decreasing particle size of the soil substrate. Geomorphology exerts control on soil carbon levels by determining erosion/accretion rates of sediment and SOC and access to water/nutrients and through the provision of local microenvironments (e.g., climatic or protection from fire) that allow the development of vegetation types that sequester and cycle carbon at different rates. Local microenvironments can also modify microbial respiration rates. The role of a variety of natural and anthropogenic disturbances in modifying SOC inventories has received increased attention in recent decades owing to the large role that land-use change plays in determining the magnitude of transfer between the terrestrial carbon source/sink and the atmospheric C02 reservoir. Some disturbances such as deforestation/logging, agricultural, and grazing practices are clearly anthropogenic while others such as windthrow, climatic extremes (drought, etc. ), insect plagues, and diseases are more directly attributable to natural causes. In the case of disturbances such as biomass burning, it is often more difficult to ascribe a uniquely anthropogenic or natural cause, and the possibility of anthropogenic climate change means that all the above disturbances might now in part be related to human activities. In this sense, C02/nitrogen fertilization effects and afforestation can also be classed as anthropogenic disturbances affecting the SOC pool. The most immediate effect of the above disturbances on the SOC pool is to modify the rate at which carbon is delivered to the soil, either by changing the rate at which carbon is sequestered by living biomass, or by diverting carbon sequestered by live biomass directly or indirectly back to the atmosphere. Disturbance can also modify the rate at which carbon is returned to the atmosphere by microbial respiration. In many cases disturbance can lead to long-term changes in local vegetation and soil structure which means that during the period over which the disturbance is maintained, and over which a new equilibrium is established following the cessation of disturbance, the local SOC pool can act as either a source to, or a sink from, the atmosphere. Thus, disturbance can lead to permanent changes in SOC inventories and to transient changes in carbon fluxes from the disturbed area. Hence time is an important vari able when considering the response of the SOC pool during and following disturbance. The complex interactions possible between all of the above variables are one of the root causes of the many uncertainties surrounding the dynamics of carbon exchange through and within the soil carbon pool. Predictable variations in the SOC pool have been observed in either comparative studies between soils from contrasting climates (Jenny, 1961; Trumbore, 1993) or contrasting soil textural types (Parton et al., 1987), transects along climatic gradients (Townsend et al., 1995), transects across soil chrono/topo sequences (Goh et al., 1976;), and comparisons between disturbed and undisturbed areas (Townsend et al., 1995; Desjardin et al, 1993). In addition, some studies have attempted to look at SOC trends on the continental (e.g., Spain et al., 1983; Moraes et al., 1995) or global (e.g., Post et al., 1982) scale using data compiled from literature sources and have been able to deduce major trends in SOC inventories with respect to climate and soil type, but generally with much scatter in the data. 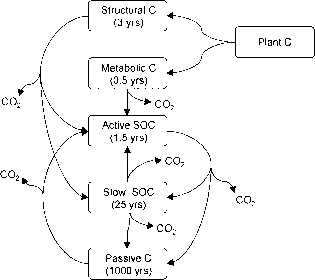 FIGURE 2 Carbon flows in the Century model (Parton et al., 1987). against observational data at field sites with global distribution with agreement between modeled and observed SOC inventories of less than 25% at all sites (Parton et ai, 1993). Observed global trends in SOC that result from the interplay of the factors described in the previous section and elucidated by the kind of studies discussed above are summarized in Table 3. The major global trends in soil carbon inventories relate most closely to the interactions between climate and soil texture. Thus SOC inventories tend to be high in wet, low-PET (potential évapotranspiration) regions in the tropics/subtropics because of high plant production and in extratropical regions because of relatively low microbial remineralization rates. Conversely, hot, dry regions have low SOC inventories because plant production is low compared to microbial remineralization efficiency (Post et al., 1982). Overlain on this climatic control in any region, fine-textured soils tend to have higher carbon inventories than coarse-textured soils, due to organomineral interactions between SOC and clay particles that lead to the physical protection or chemical stabilization of a higher proportion of SOC (Mayer, 1994; Skjemstad et al, 1993; 1996). The broad relationship between SOC, climate, and soil texture is illustrated in Fig. 3 (see also color insert). Local geomorphic effects tend to lead to higher carbon densities at locations that are lower in the landscape, due to downslope movement of carbon and nutrients and more reliable access to ground and surface water. Carbon inventories tend to be higher along watercourses, and in the case of fire-prone regions carbon inventories tend to be higher in local topographic depressions that are protected from fire. The extreme case of geomorphic localization of SOC is in the development of peat bogs. Potential mean soil carbon turnover rates FIGURE 3 Potential mean soil carbon turnover rates extrapolated to the global scale using the temperature and soil texture relationships from the Century model (Schimel et al., 1994). See also color insert. of trees within a savanna and the location of savanna/woodland/ forest boundaries are themselves the results of complex interactions between climate, fire frequency, soil type, geomorphology, and grazing pressure (e.g., Archer, 1990). At the local scale several general trends in SOC can typically be identified within a single soil profile. As a result of most input of carbon to a soil profile being introduced from the overlying standing biomass, SOC generally decreases down the profile, approximated by a log-log function (Zinke et al., 1986). As much as 50% of the total SOC inventory to 1 m may be present in the top 20 cm of the profile, with the surface here being taken as the top of the mineral soil horizon. The degree to which carbon is concentrated in the upper soil layers is a function of soil type, rooting depth, and climate. Intensive, deep bioturbation such as characterizes most tropical regions leads to a more gradual decline in carbon stocks with depth compared with colder regions where bioturbation is minimal and permafrost may limit downward movement of SOC. Grassland soils tend to have a higher proportion of SOC in deeper soil layers than in comparable forested regions, possibly related to deeper rooting in grassland ecosystems. There is generally an increase in the average turnover time for carbon in soil (as indicated by 14C) with decreasing temperature and or precipitation (Trumbore, 1993), reflected in a slowing of microbial respiration rates (Raich and Schlesinger, 1992). In an individual soil profile, the l4C age of soil carbon tends to increase with depth in a soil profile (Townsend et al., 1995; Desjardin et al., 1993), and also with decreasing particle size (Buyanovsky et al., 1994), reflecting an increase in the relative proportion of old refractory carbon in fine particles and the deep soil. Many studies have examined the controls of SMC distribution in soils. The primary control on the S"C composition of SOC is the S13C value of the carbon being delivered to the SOC pool from live biomass. Large differences are controlled by the distribution of C, and C4 vegetation in terrestrial ecosystems, which in turn are determined by climate (Lloyd and Farquhar, 1994). Smaller differences are determined by factors such as altitude (Bird et al., 1994), soil water availability (Stewart et al., 1995), irradiance (Ehrlinger et al., 1986), and the degree of reutilization of respired CO, in closed canopies (Van der Merwe and Medina, 1989). Carbon can remain in the SOC pool for a long period after its assimilation by vegetation. This means that not all carbon in the SOC pool is in equilibrium with the isotopic composition of the modern atmosphere due to a decrease in the <5' 3C value of the atmosphere as a result of fossil fuel burning since industrialization (Freidli et al, 1986; Bird et al, 1996). "Old" carbon will therefore be enriched by up to 1.5%o compared to recent carbon. This "terrestrial Seuss effect" needs to be considered when calculating the 5' 3C value of C02 respired to the atmosphere from the SOC pool (Fung et al, 1997). Metabolism of carbon, once it enter is introduced into the SOC pool by soil microbes and fauna, progressively modifies the ¿>I3C value of SOC. Two major processes compete in determining the <5I3C value of the carbon remaining from metabolic processes. The selective utilization of nutrient- and energy-rich compounds such as sugars and proteins tends to increase the relative proportions of components such as lignin in the remaining carbon, and these compounds have <5I3C values lower than the bulk biomass of which they were a part (Benner et al, 1987). Conversely, kinetic fractionation effects that accompany metabolism tend to favor the respiration of 1JC, thus increasing the ¿>I3C value of the carbon partitioned into microbial biomass (Macko and Estep, 1984; Blair et al., 1985) and ultimately into the "slow" and "passive" SOC pools. The model proposed by Agren et al. (1996) links the <5I3C of carbon in SOC to the initial "quality" of the litter as a substrate for microbial respiration, with progressive changes in the <5I3C value of degraded carbon from poor quality litters being small or negative, and from high quality litters being higher and positive. Krull and Retallack (in press) have suggested that the observed fractionation accompanying degradation in soils can be grouped into two major categories. In poorly aerated soils, when aerobic respiration is retarded, organic matter accumulates and selective utilization of some compounds leads to a reduction in the ¿>13C value of the remaining carbon due to a relative increase in the proportion of the more refractory low — l3C lignin compounds. In well-aerated soils, kinetic isotopic fractionation dominates and the remaining carbon is enriched in 13C. A further mechanism that has yet to be considered is the role of macrofauna in the decomposition of organic matter. In the seasonally dry tropics, for example, it has been estimated that 20% of organic matter decomposition results from the action of termites (Holt and Coventry, 1990). Since methane is an abundant product of the decomposition of organic matter in termite nests, it is possible that the remaining SOC residue is substantially enriched in l3C. The concentration of the partly "stabilized" products of microbial metabolism in the fine fraction of the soil coupled with the decreasing atmospheric C02 SI3C value since industrialization means that old, refractory, clay-associated carbon has a higher SI3C value than coarser particulate carbon (Kracht and Bird, in review). In tropical savannas, this trend of increasing SI3C values with decreasing particle size is augmented by the preferential accumulation of C4-derived carbon in the fine-particle-size fractions (Bird and Pousai, 1997). At the regional/global level, there have been relatively few observational studies of variations in SOC §13C value. Bird et al. (1996) demonstrated the existence of a latitudinal gradient in the ¿>I 3C value of surface SOC in forest soils, with tropical forest soils having approximately l-1.5%o lower ¿>I3C values than those of high-latitude forest soils. This was attributed to a temperature gradient in the turnover times for carbon in the soil (the "terrestrial Seuss effect") and possibly to a ~0.5%o temperature effect (Bird and Pousai, 1997). Bird and Pousai (1997) found that §13C values and carbon content on a rainfall transect through northern Australia could be de scribed by a log-linear relationship with monsoon forests at one end, tropical grasslands at the other, and savanna samples distributed between these two end-members. Despite the many advances made in understanding the factors governing SOC behavior described in the preceding sections, a major barrier to a refined predictive understanding of the behavior of the SOC pool at the global scale is exemplified by the quote above. Similar statements are echoed in virtually all studies that attempt to compare or compile results from published studies. These problems largely result from many early individual studies that were conducted for purposes not related to current interests in global change research and, as such, employed sampling strategies that were not optimal for the construction of global SOC inventories or for the modeling of SOC dynamics. In addition, the available global inventories of SOC and the trends discussed in the preceding section do not provide data that can be used to validate models of SOC dynamics, other than by confirming gross trends in carbon storage. These problems can be grouped into three "types" — definition, sampling, and analysis. A significant problem exists with respect to the definition of what constitutes soil carbon. Many studies make a strong distinction between "mineral soil," the organic "O-horizon," and "litter" and most estimates of the size of the SOC pool refer only to the size of the SOC pool in the mineral soil. However, in cool temperate regions, a significant portion of the total SOC is present in the litter and O-horizon of many soils. This carbon may have been "dead" for a century or more. Much of this material can be considered SOC in the sense that it is dead organic carbon in a variable state of decomposition, which provides a source of nutrients for the living rooted biomass and a substrate for microbial metabolism. A more appropriate definition of SOC for global change requirements might be that SOC represents all dead carbon from the land surface down (i.e., from the top of the conventional litter horizon) with no dimension greater than 2 mm, including such carbon present in the litter and O-horizons. All material greater than 2 mm is thus considered litter, a size that is commonly used in soil science and a distinction that is easily made and readily quantifiable. The present distinction between litter and the O-horizon is ambiguous in that in reality a continuum exists between carbon in litter, O-horizon, and mineral soil. The present distinction also cannot account for the presence of subsurface litter derived from recently dead roots, the turnover dynamics of which may be more similar to surface litter than the mineral soil. An additional definition problem relates to the description of sampling localities in many studies simply in terms of soil type. This again may be of use in pedogenic studies, and does allow some inferences to be drawn regarding the factors likely to control SOC dynamics. However, it does not provide the quantifiable textural and geomorphic information that is crucial in determining SOC dynamics and required as input for modeling studies (Parton ct al., 1987). Many studies are also not conducted with a view to separately quantifying carbon inputs from different sources. In forests, local carbon inventories have been shown to vary widely depending on the distribution of trees (Liski, 1996). In mixed savanna ecosystems, the carbon inputs from tree and grass sources are not necessarily equivalent, and will vary spatially with the proportion of each source (this problem is particularly acute in terms of the §I3C value of tropical savanna SOC). Lack of an agreed sampling protocol presents a major problem in comparing the results from different studies. Individual studies sample over different depth increments to different depths (or by horizons) and in many cases do not incorporate soil density data. Where no soil density data are available, authors have attempted to use a variety of inferential techniques to estimate carbon density from %C data. While this can provide a crude estimate of carbon densities, Bird (1998) for example, found that one of the effects of grazing on similar basalt-derived soils was to increase soil density in the 0- to 5-cm interval by 25-35% and any attempt to estimate carbon density from a single approximated soil density estimate would introduce a similar error into the calculated carbon densities. 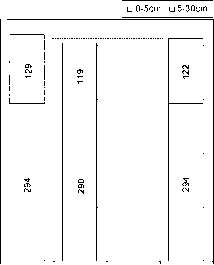 The general use of soil pits means that samples and bulk density measurements are usually made horizontally into the pit wall at the mid-point of the sample interval, rather than by collecting the whole depth interval; this can potentially introduce (smaller) biases if the distribution of carbon with depth is not uniform. In addition, there is little uniformity in the literature with regard to whether samples are sieved or not, and whether/how soil carbonate is considered. Further large uncertainties are introduced into previously published data by the use of different analytical techniques. Combustion in oxygen at high temperature (in a variety of forms) is now the preferred method of determining carbon abundances in soil samples. However, much of the literature data on which many of the regional and global SOC inventory studies have been based also include data generated using either Walkley-Black wet oxidation or "loss on ignition" techniques (e.g., Moraes et al., 1995). It has long been known that the Walkley-Black technique underestimates total organic carbon and if any attempt is made to compensate for this fact, it is common to multiply the measured values by a factor of 1.3. This factor seems to derive from the original work of Walkley and Black (1934) and represents the average under-estimate of carbon from the analysis of seven soil samples, where the factor calculated for the individual samples ranged between 1.16 and 1.66. The value of 1.3 has been widely applied (e.g., Little ct al, 1962) but because Walkley-Black oxidation does not measure "recalcitrant" carbon, it can be expected that the proportion of such recalcitrant carbon in soils will be highly variable depending on the nature of the carbon delivered to the soil from standing biomass, fire frequency, and other soil parameters. Loss on ignition measures "organic matter," and a single invariant factor (generally 0.58, the van Bremmelen factor) is usually multiplied by the observed organic-matter content to calculate the percentage of carbon in the sample. However, it is known, for example, that this factor is variable and can be as low as 0.45 in the tropics (Burringh, 1984). Uncertainties in this factor will flow directly into uncertainties in the calculated carbon densities. The above discussion suggests that depending on the sampling and analytical protocols used to estimate carbon inventories at the same single site, the results might easily differ by 10-20%. To this uncertainty must be added the inherently high variability in the SOC pool at all spatial scales in response to the factors outlined in preceding sections. Unlike live vegetation, there is currently no means to remotely sense SOC stocks. SOC stocks can be estimated from SOC models coupled to NPP estimates derived from remotely sensed data, but observational SOC data are not usually collected in such a way as to be able to provide a means of validating model results. The situation is even more difficult with respect to current knowledge of the carbon-isotope composition of the SOC pool. Work in this area with few exceptions (e.g., Bird et al., 1996; Bird and Pousai, 1997) has focused on using carbon isotopes as a tracer of carbon dynamics and vegetation change in local regions. There is an urgent need for techniques that can be used to provide observational estimates of the carbon-isotope composition of the SOC pool and of carbon fluxes from the SOC pool to the atmosphere. Several models are now available that can predict isotope fractionation by the terrestrial biosphere (e.g., Lloyd and Farquhar, 1994) and this knowledge provides important constraints on source/sink distributions when coupled with measurements of the isotopic composition of the atmosphere (Cias et al, 1995; Fung et al, 1997; Bakwin et al, 1998). There is currently no way of better constraining or testing these model results with regional observational terrestrial isotopic data. Because the SOC pool integrates the isotopic signature of local vegetation over several to many years, it potentially provides the best integrated measure of the carbon isotope composition of regional biomass, if this signature can be adequately isolated from the isotopic effects of degradation (e.g., Agren et al, 1996) and the terrestrial "Seuss effect" (Bird et al, 1996; Fung et al, 1997). There is a need for a new class of SOC data, collected globally in a consistent fashion, which allows the direct comparison of results across a wide range of climatic conditions, which can be better integrated with remote-sensed vegetation indices, and which is more amenable to the validation of models of global carbon cycle dynamics and SOC dynamics. Discussion in the previous section has highlighted the problems inherent in attempting to utilize previously published data to obtain global observational trends in the SOC pool at sufficient resolution to be of use in resolving major problems in global change research, such as the location of the "missing sink." It is also likely that the political requirements of the Kyoto Protocol will require more accurate and verifiable estimates of the size of the SOC pool and fluxes through the SOC pool than are currently possible. The approach of Parton et al. (1993) represents a useful step in this direction, holding biome constant (using 11 grassland sites with global distribution) and allowing climate and soil texture to vary. However, to define global trends better, a more instructive approach might be to hold soil texture constant and allow climate (and thereby vegetation) to vary. Thus, undisturbed vegetation on sandy soils would provide a "low" end-member, and vegetation on basalt-derived (or similar) soils would provide a "high" end-member for SOC inventories and fluxes (including isotopes) under any given climate. These two estimates could then be mixed as appropriate to provide estimates for regional storage and fluxes in a given area based on the knowledge of soil texture distribution. Vegetated aeolian sand bodies from the last glacial maximum are common in many parts of the world, as are sandy sediments in palaeochannels and glacial deposits. Likewise, fine-textured soils derived from basalts (or intrusive equivalents) are common and widely distributed across the globe. It should be noted that sandy soils have a significant advantage over fine-textured soils in that they are usually freely drained and there is little scope for the physical or chemical protection of SOC which can complicate interpretation of results, once the soil is disturbed by sampling. Such an approach neglects secondary topographic effects, but these can be avoided in the sample set by restricting sampling to locations high in the local topography. The approach therefore cannot cope, for example, with local effects such as the occurrence of peats or different SOC dynamics around watercourses, but neither can any other current approach. Holdridge (1947) provided a simple climatic classification of vegetation in terms of rainfall and precipitation, dividing the world into 30 life zones. While this classification has been superceded by more recent work, it can serve as a guide to the number of sample regions that might be needed to cover the globe, that is, 120 locations (fine- and coarse-textured sites duplicated in each life zone). FIGURE 4 Relationship between soil carbon density and soil bulk density, as well as inventories calculated from averaging of this data. The two sites are on ungrazed basalt-derived soils in the Hughenden-Charters Towers region of North Queensland (Bird, 1998), and the samples were collected along transects of approximately 1000 m in each case. Samples were collected as soil cores from the 0-5cm and 5-30cm depth intervals. Because the vegetation is a tree-grass mosaic, one-half of the total samples was collected at half-crown-distance from trees (- T) and the other half was collected at approximately equal distances from local trees (— G). In the construction of the site inventories, the total from the T and — G samples was weighted according to the estimated percent crown ( — T) cover at the site. where thick surface-organic layers are present, it may be necessary to quantify these separately, and begin depth sampling at the top of the mineral soil. All discussions below define the soil surface as the top of the conventional "litter" horizon. Where trees are widely separated, or both trees and grass are present in the biome, a separate suite of samples must be collected from each category as tree distribution has a major impact on local variability in the SOC pool as discussed in preceding sections. All samples must be subject to particle-size fractionation to provide the textural information required for the interpretation of observed variations and as model input. Even when an attempt is made to control variables in the manner proposed above, there will still be local variability that cannot be encompassed if sampling is restricted to a few soil pits. Liski (1996) has suggested, for a boreal forest on a sandy substrate in Finland, that a minimum of 30 samples are required for a 10% confidence interval on the mean value obtained for the carbon inventory, and the number of samples required is likely to be higher than this for more heterogeneous tree-grass ecosystems. Carter et al. (1998) found that 15 random soil samples were required from 1° X 1° grid cells in Queensland (Australia) to define the average SOC content of a cell to within 10% of the "true" mean, while about 40 samples were required for an estimate to within 5% of the mean. Based on the number of sample regions and the number of samples per region suggested above, a global sampling program with 3 or 4 depths and 3 or 4 size fractions per sample would require between 200,000 and 300,000 individual analyses of carbon content. The analysis of this number of samples would be prohibitive. However, a stratified sampling approach provides a mechanism for "bulking" many equivalent individual samples into a single "stratified" sample, encompassing local variability and reducing the required analytical effort to approximately 12,000 samples. For such an approach to be viable, it must be able to reproduce results obtained from the averaging of many results from individual samples from the same area. Figure 4 shows results for individual samples taken from two transect sites (~1000 m length) in ungrazed savanna areas on basalt-derived soils in north Queensland (Bird, 1998). It also shows the carbon inventories calculated from averaging these data for areas beneath tree canopies and areas remote from trees and the calculated average carbon density for the sites weighted according to the percentage crown cover at the site. There is considerable scatter among the individual samples but averaging 10 samples at each site yields closely comparable total inventories (408 vs 422 mg/cm2 0-30 cm). A comparison between these results (40 analyses per site) and the results obtained using the stratified sample approach (four analyses per site) both for basalt soils and for a sandy granite-derived soil from the same region is provided in Fig. 5. The inventories obtained using each approach give essentially identical results and highlight the large texture-controlled differences in carbon inventories between the granite and basalt soils. The concordance between the results from the single sample and stratified sample approaches is to be expected as mixing between carbon inventories (i.e., per unit volume) can be expected to be linear. FIGURE 5 Comparison of the results from Figure 4 with the stratified approach, whereby a volumetric fraction of each sample type was added to a bulk sample, producing four site-averaged samples (0-5T, 0-5G, 5-30T, and 5-30G) from 40 individual samples. These samples were analyzed as for the individual samples and the inventories weighted according to percent crown cover as for the individual samples. Results are shown for the basalt-derived soils from Figure 4 and for a site on sandy granite-derived soil. FIGURE 6 Relationship between the value of SOC and soil carbon density for the samples shown in Figure 4. The S13C results from these samples (Fig. 6) provide support for the conclusion that mixing between carbon sources (trees and grass) is linear and that therefore the analysis of stratified samples provides a representative value for the regions sampled. The relationship is further confirmed by similar results for both sandy and clay soils from Zimbabwe (Bird et al, 2000) as shown in Fig. 7. The regular decrease in S13C value with increasing carbon density relates to higher carbon per unit area in those areas beneath C, trees and/or the longer residence lime of Ci-derived carbon once it enters the SOC pool. Below 5 cm depth, the relationship is less clear owing to the effects of degradation on the isotopic composition of SOC and to less tight coupling between SOC at this depth and the vegetation currently overlying the site. FIGURE 8 Carbon densities for the 0-5 cm interval of stratified samples (approximately 75 samples bulked into one sample per region) on a transect from the U.S.-Canada border to the Canadian Arctic, through Alberta and the Northwest Territories. "Biotemperatures" (as defined by Holdridge, 1947) range from 10.5°C for Cypress (50°N) to 1.5°C for Windy (68°N), while precipitation (excluding snowfall) ranges from 750 to 60 mm for the same two sites, respectively. Also shown is the l4C activity of the 63- to 500-jitm fraction, which indicates a consistent increase in apparent residence time from —40 to —250 years with decreasing temperature and precipitation. The surface layer in all cases is taken to be the top of the "litter" layer, and the data refer to the < 2000-/xm fraction. FIGURE 7 Similar relationships between 5"C and SOC density pertain to both sandy and clay soils at the Matopos Research Station, Zimbabwe (Bird et al., 2000). The relationship appears to be independent of the fire regime imposed, from an annual burn to complete protection from fire since the experiment began (1947-48). in temperature and precipitation along the gradient, which results in a gradual decrease in the thickness of the litter and O-horizons. These data suggest that regional trends in SOC can be elucidated using the stratified sampling approach. 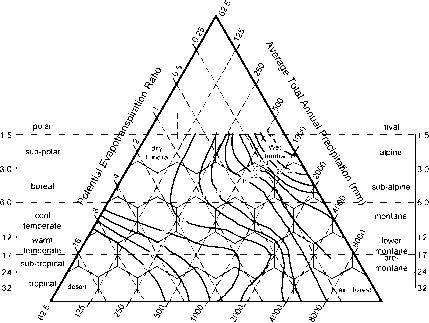 Figure 9 compares results obtained using this approach from sandy soils in different climatic regions. Carbon inventories increase from water-limited savanna sites toward both the humid tropical site and the cold high-latitude site. In addition, the proportion of the total inventory in the 0-5 cm interval is higher in the cold high-latitude site than in the low-latitude sites. Both these observations are in accord with the trends to be expected from discussion in earlier sections, with the development of thick litter and O-horizons in high-latitude soils and their absence in lower-latitude soils. represented and, for example, the 0- to 5-cm inventory for the Edmonton sample (Fig. 5) is approximately the same as the total 0- to 30-cm interval inventories at the Cape York and Zotino sites, and thus the 0- to 30-cnr inventory for the Edmonton site can be expected to be considerably greater than at either of these sites. An additional advantage of the stratified sampling approach is that it enables a suite of more time-consuming analyses to be performed on a greatly reduced sample set. For example, Fig. 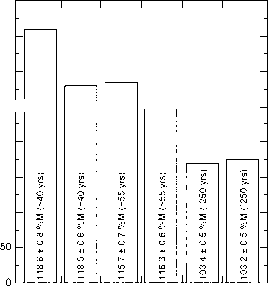 10 shows results for the particle-size distribution, carbon distribution, and carbon-isotope composition of the 0- to 5-cm interval. Despite the similar mineral particle-size distributions in the two data sets, climate, vegetation, and fire regime have imparted very different characteristics to the distribution of carbon and carbon-isotopes between the different size fractions. Again, these differences are readily explicable in terms of the processes described in preceding sections (see figure caption). Stratified samples are also amenable to radiocarbon analysis and can potentially provide better "average" turnover times for particular climatic/soil-texture conditions than site-specific studies, using any of the available methodologies (e.g., Bird et al., 1996; Trumbore, 1993; Harrison et ai, 1995). 14C results for the 63- to 500-jU.m fraction for the stratified Canadian samples discussed above are provided in Fig. 8. Again, the apparent turnover times for carbon in this size fraction increases with decreasing temperature and precipitation in keeping with expectations based on discussion in preceding sections. An as yet little explored possibility is using the l4C activity of microbial carbon (Ladd and Amato, 1988) or microbially respired C02 to obtain an integrated measure of the average turnover time of SOC in a soil sample. The rationale behind this statement is that while the microbial carbon pool turns over rapidly, the 14C activity of the microbial carbon pool will be determined by the amount-weighted l4C activity of the substrate being metabolized. Thus if recalcitrant, degraded carbon is not being utilized for microbial metabolism (and thus is not relevant to the global cycle on decadal-centennial timescales) it will not be recorded in the l4C activity of the microbial carbon or microbially respired CO,. The measurement of the l4C activity of CO, microbially respired from root-free soil in the laboartory is technically straightforward (Santruckova et al., in press), but the possibility exists that in disturbing the soil from its field location may make "protected" carbon available for metabolism. 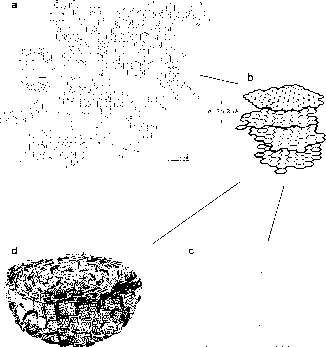 The physical separation of microbial carbon from a soil sample requires the preparation of two samples (Jenkinson, 1988). The first sample is extracted with K2S04, while the second is fumigated with chloroform and then extracted with K2S04. The chloroform fumigation renders a proportion of the microbial carbon extractable in K2S04. The proportion and l4C activity of the microbial carbon are then determined by mass balance. While this approach has the advantage of providing an instantaneous "snapshot" of microbial carbon at the time of collection (assuming that microbial activity is halted by drying or freezing soon after collection), the neccessity for a mass balance calculation introduces additional uncertainty into the calculation of the microbial 14C activity, and it is also unclear whether the fumigation step only liberates microbial carbon (Badalucco et al., 1992). As an initial test of this approach, the samples representing the "warmest" (Edmonton) and "coldest" (Windy) locations on the Canadian transect were analyzed using both techniques. Figure 11 shows the results obtained using both techniques. The microbially respired C02 results suggest reasonable turnover times slightly shorter than the 63-500 ¡xm fraction of the same soils. The results obtained from the fumigation-extraction technique yields much shorter apparent turnover times with much larger errors. One explanation for the discrepancy between the two results is that microbes do not partition all carbon equally between assimilative and respiratory processes. It is possible that younger more energy-/nutrient-rich carbon is more likely to be partitioned into biomass while older carbon is used to support respiration (J. Schimel, personal communication). 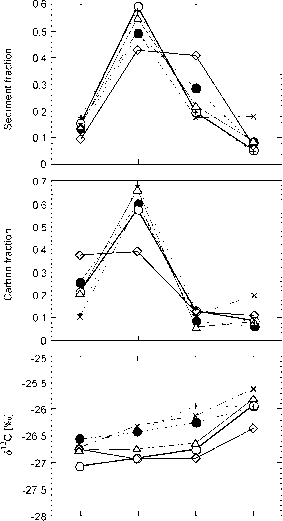 The fact that the microbial carbon ,4C activity of the Edmonton sample lies above the predicted relationship between 14C activity and turnover time for 1996 further suggests that a carbon atom can be cycled within the microbial carbon pool for an average of ~ 10 year before it is respired or passes to the "slow/passive" pool in this sample. These preliminary results suggest that the respired CO, technique might provide more reliable estimates of SOC turnover time than the fumigation-extraction technique. In sandy soils where there is little chance for carbon to be physically protected, the potential problems identified above relating to the physical disturbance of the sample might be avoidable. FIGURE 10 Size distribution of clastic particles as well as size distribution and isotopic composition of carbon in stratified samples from the Canadian transect (Fig. 8) and the Matopos fire trials (Fig. 7). While the clastic size distribution is similarly sandy for most samples, there are dramatic differences in the distribution of carbon between the same size fractions. Carbon is uniformly present in the coarser size fractions of the Canadian soils, but is variably enriched in the finer fractions of the Matopos samples. The distribution of carbon between size fractions at Matopos is controlled by fire frequency, with a regular increase in carbon in the finer fractions with increasing fire frequency, leading to the combustion of coarse material. The á"C value of carbon increases with decreasing particle size in the Canadian samples by ~ Woo due to the terrestrial Seuss effect and fractionation associated with microbial degradation (Bird and Pousai, 1997). The 5,3C value of carbon in the Matopos samples increases by 2-3%o with decreasing particle size owing to the differential input of C4-derived carbon into the fine fractions or the selective preservation of C¡-derived carbon in the coarse fractions (Bird and Pousai, 1997). The SUC values of the Canadian samples are typical of high-latitude C¡ forests (Bird et ill., 1996), while the Matopos values are indicative of a variable input of C4-derived carbon. It should be noted that the Matopos results were obtained by duplicating the stratified sampling at two sites subjected to each of the burning regimes in each case. The comparability of the results (indicated by the error bars) from these independent duplicate samplings provides further evidence that the stratified sampling approach can produce reliable results. 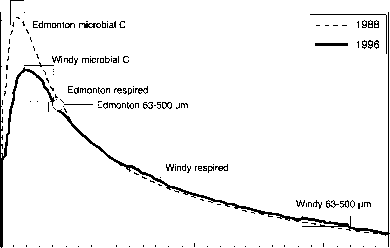 FIGURE 11 14C activity of microbially respired C02, microbial carbon (by fumigation-extraction), and the 63- to 500-/u.m particle-size fraction of the Edmonton and Windy stratified samples (see Fig. 8). Also shown is the relationship between residence time and ,4C activity expected for 1996 when the samples were collected and 1988, the last time that values as high as observed for the Windy microbial carbon sample could have occurred in the SOC pool. Discussion in the previous sections has demonstrated that the mechanisms underlying observed trends in the SOC pool are understood to the extent that models have been developed that can adequately describe observed patterns of carbon distribution at well-documented field sites. Further discussion has also demonstrated that the number of such sites with consistency in sampling and analytical protocols sufficient to provide further constraints for global models is small. While it is not intended to supplant further process-oriented studies at individual sites, it has been argued that there is a need for a new class of SOC data, aimed at refining our understanding of how the determinants of SOC behavior interact at the global scale. This style of data must use consistent methodologies from globally distributed sites to produce information on SOC stocks, fluxes, potential respiration, and isotopes. This information must be consistently coupled to textural and depth-distribution data that take local variability into account and can provide regional-scale estimates in a format suitable for comparison with model-derived data. Some effort in this direction is already being made (Paustian et al., 1995; Falloon et al, 1998). Sandworld and clayworld, that is, observational estimates of SOC parameters from coarse- and fine-textured substrates distributed across the full spectrum of global climatic zones, are achievable technically and logistically. They represent a natural extension of process-based site-specific studies and will be required to further refine our understanding of the SOC pool at the global scale. Such a refinement will be required to address the major current questions surrounding the functioning of the global carbon cycle and to answer the political questions that will arise as a result of the ratification of the Kyoto Protocol. The completion of this manuscript was greatly facilitated by a visiting fellowship provided by the Max Planck Institute for Biogeo-chemistry.